In order to assist Japanese enterprises in conducting business activities in Vietnam as well as providing offices for Japanese enterprises to work & meeting their partners, BTD established BTD Square in Hanoi in January 2016 and BTD Square in Naha in January 2017. BTD Square has a modern meeting room with OA devices such as video conference system, projector, color printer and photocopier. Japanese enterprises may use office of BTD Square to register with state management agencies to set up representative offices or set up commercial & trading companies. 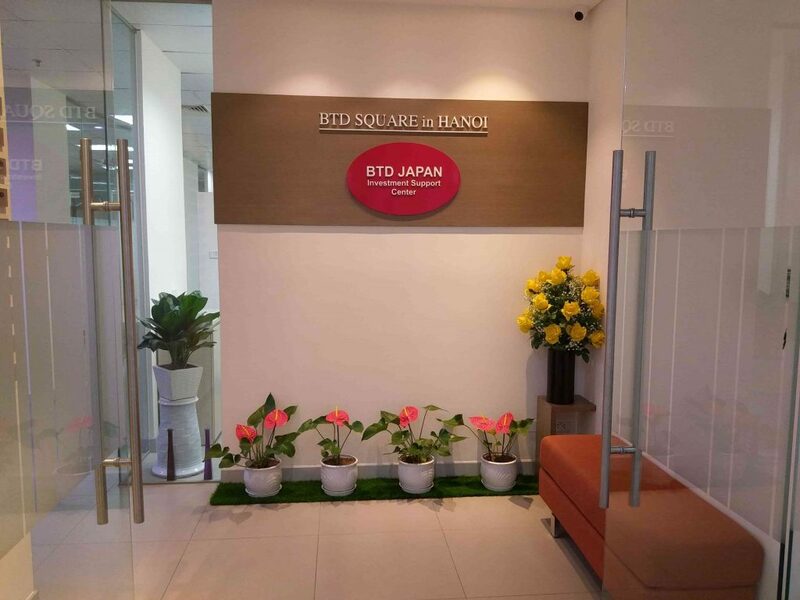 BTD Square’s office is very convenient especially for Japanese enterprises investing in Vietnam for the first time: These enterprises can use BTD Square’s office as a workplace during the establishment of the investment project and plant construction, as the place for meeting partners, interviewing employees, etc. With a convenient location in the city, using BTD Square office will help you to hold effective business meetings in Hanoi. 1 Wooking room with 01 table and 04 chairs for at least 04 people; 01 document cabinet; 01 telephone line. 2 Registered transaction address of BTD Square: Floor 8, Diamond Flower Tower, Lot C1, Trung Hoa Nhan Chinh Urban Area, Nhan Chinh Ward, Thanh Xuan District, Hanoi. 10 Air-conditioner in office hours from 08h00 to 17h00 from Monday to Friday; from 08h00 to 12h00 in Saturday. After office hours, air-conditioner fee will be calculated according to regulations of the building investor.